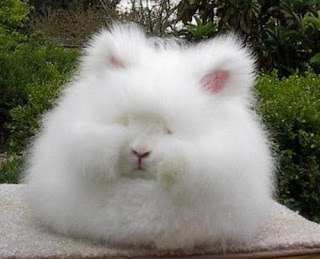 The Angora rabbit is a variety of domestic rabbit bred for its long, soft hair. The Angora is one of the oldest types of domestic rabbit, originating in Ankara, Turkey, along with the Angora cat and Angora goat. The rabbits were popular pets with French royalty in the mid 1700s, and spread to other parts of Europe by the end of the century. They first appeared in the United States in the early 1900s.They are bred largely for their long Angora wool, which may be removed by shearing, combing, or plucking (gently pulling loose wool).There are many individual breeds of Angora rabbits, four of which are ARBA recognized.They are English, French, Giant and Satin. Other breeds include German, Chinese, Swiss and Finnish, to name a few. Angora Rabbits are active, playful and social with lots of personality. They enjoy the attention of their owner, as well as the companionship of other rabbits and often house angora will nap with a docile mannered cat. They enjoy having toys, for example a plastic ball, a pine cone, a piece of soft wood, a stuffed sock, or an old glove. This is the largest of the four ARBA recognized Angora breeds. 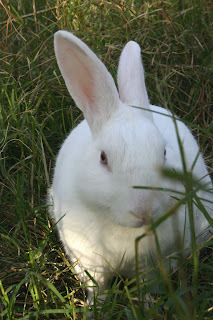 The only color ARBA officially recognizes for Giant angora is REW (Ruby Eyed White), or as more commonly referred to as an “albino”-indicating the absence of color pigment in the genetic makeup. The Giant Angora produces more wool than the French, Satin or English Angora. Like the German angora Giant Angora rabbits do not molt; And like the German Angora, they require their wool to be clipped or shorn off at least once every 90 days. The Giant Angora is the largest of the ARBA accepted angora breeds, having been created by Louise Walsh to be an efficient wool producing rabbit sustained with 16-18% alfalfa based rabbit feed & hay and living in the standard size all wire cages used for commercial breeds. Its coat contains three types of wool: under wool, awl, and guard hair; the awl type wool exists only on the giant and German angora. This breed should have furnishings on the face and ears. Many people confuse German angora with Giant angora, but they are not the same.